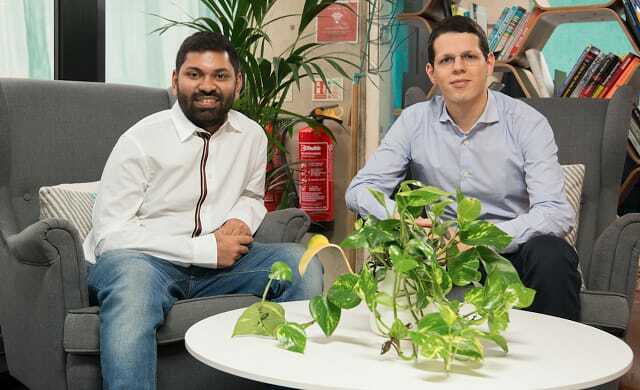 Karthik: Ahauz is a proptech start-up helping first time buyers get a foot on the property ladder, something which has been incredibly difficult in recent years, especially in urban centres like London. João: We help young professionals to buy their first house by boosting their deposit – we do this by offering an additional 15% for any first time buyer who has 5% of the purchase price to put down. This means that first time buyers can access better interest rates and afford a house of larger value. Karthik: It all began with João who had experienced the struggle to get on the London property ladder first hand. He found it impossible to save for a sizeable deposit, given ever increasing house prices in the capital. We had been friends since our days working together at a start-up in Berlin and he turned to me and proposed to pool our savings into one deposit, however we found that he was still unable to secure a mortgage. João: We saw a massive problem which in turn meant a massive opportunity. We quickly realised that thousands of other young professionals were in the same position and could not rely on their parents for help. That was when we decided to start building Ahauz as we wanted be the ‘bank of mum & dad’ for everyone. João: Homeownership is one of the most pressing issues in the UK and we had seen the issue first hand, as we are part of the target market ourselves. Especially, among 25-34 year olds there has been a decline in owner occupiers from 55% a decade ago to a forecast of 18% by 2020. People have lost the ability to put together a sizeable deposit, therefore we knew there was a massive opportunity to help first time buyers. João: I built my career advising private equity and corporates on growth strategy and business development. Karthik: I managed product strategy and financial planning at Care.com (online marketplace) which is where we met in 2012. João: From the moment we both met while working at Care.com, there was always the ambition of doing something together in the future. When we came across this massive problem faced by first time buyers, we were inspired to tackle it together. João: We met Forward Partners quickly after starting to fundraise. We could see that they believed in the vision we had for the product and the market opportunity. We also liked the team at Forward Partners and the opportunity to leverage both the product and investment team was a massive plus. Additionally, we have raised and continue raising money to fund Ahauz’s contribution towards the deposit of first time buyers contributions. The current funding has come mainly from HNW property investors. For more on Ahauz’s funding round, click here. Karthik: Prospective buyers bring a minimum of 5% deposit. Ahauz will contribute up to 15% towards their deposit. This will allow them to take an 80% LTV mortgage with an Ahauz lender partner. This enables them to access better interest rates and afford a house of larger value. It can also help them not use all of their savings on the same house, and retain some for a rainy day. Ahauz’s contribution to the buyer’s deposit comes from a fund which provides investors with the opportunity to invest in the high resilient UK residential market while actually supporting people getting on the property ladder. Ahauz lending partners will pay us a fee for introducing buyers as mortgage clients. Also, we charge a fee to the investors who provide the contributions for the deposit. Karthik: It was the moment we finally got lenders on board to accept Ahauz’s contribution to the deposit– thus effectively making us the bank of mum and dad. Karthik: We are at a very early stage of our journey, but being perseverant and having fun along the journey has helped us so far. Where do you want to be in five years‘ time? João: We see ourselves being at the forefront of helping first time buyers getting on the property ladder. We also want to continue supporting our existing customers and their future housing related financial needs.